For Home Care in Annandale, Virginia, Professional Healthcare Resources is the right choice. We have been serving members of this community for well over 20 years and counting, and we take our responsibility to the community quite seriously. All of our team members are passionate professionals that sincerely want to deliver world-class home care at all times. Annandale is a Fairfax County town that offers a fantastic quality of life. Residents can enjoy the profound change of seasons, and there are good schools, beautiful parks, and a number of historic sites. It has a unique charm all its own, and everything that the metropolitan area has to offer is easily accessible. We have served many locals over the years, and we greatly value the relationships that we have developed. If you are located in Woodburn, Red Fox Forest, Alpine, Canterbury Woods, or any other section of Annandale, Virginia a home care resource you can trust will always be nearby. The vast majority of senior citizens will need some type of help with their activities of daily living eventually. 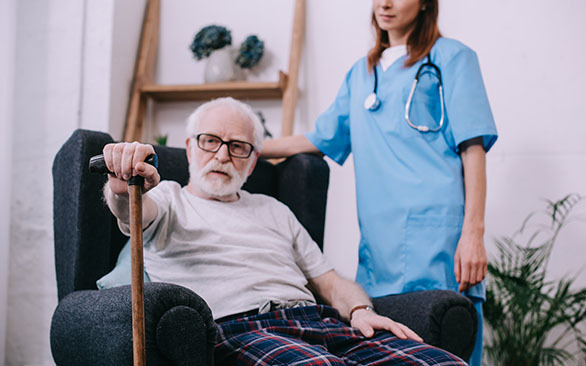 Some will reside in assisted living communities and nursing homes, and others will be able to receive the care that they need in their own homes. It may be logical to assume that Medicare would pay for home care or a stay in an assisted living facility, but this is not case. Medicaid is another government health insurance program that will pay for long-term care. The Medicaid Home and Community-Based Services Waiver Program will cover home care for Annandale, Virginia seniors. We can explain the eligibility requirements if you are interested in elder care that is paid for by Medicaid. You can definitely rely on us for home care, but our offerings do not stop there. We can be called upon to provide in-home physical therapy as well. Our physical therapists are that best of the best, and we also assist clients that need speech therapy or occupational therapy in Annandale, Virginia. Whenever you need physical therapy, skilled nursing services, or home care in Annandale, Virginia, 24 hours a day, 7 days a week, we are on call. You can get in touch with us by phone at 703-752-8700, and there is a contact form on this website that you can use to send us a message.